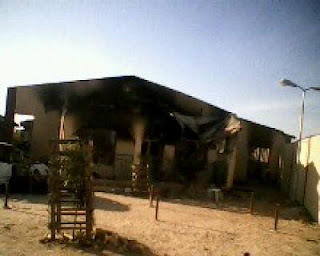 Yimiton's Blog: Bomb Blasts and sporadic Gun shots in Damaturu, Yobe State, blamed on Boko Haram. Bomb Blasts and sporadic Gun shots in Damaturu, Yobe State, blamed on Boko Haram. Barely 24 hours after suicide attacks claimed by Islamists and reprisal attacks by angry Christian youths left 52 people dead in Kaduna a fresh outbreak of unrest hit Damaturu, the capital of Yobe State. The new outbreak of unrest on Monday in Damaturu, previously hit by heavy violence blamed on Boko Haram, came after authorities said they had restored calm in Kaduna State. Boko Haram claimed responsibility for three suicide attacks on churches in Kaduna state on Sunday which led to deadly rioting, while police blamed the group for the violence that broke out in Damaturu. A military commander said the Damaturu unrest on Monday occurred after authorities arrested a Boko Haram suspect, prompting other members of the group to respond by setting off explosives and shooting indiscriminately. A Boko Haram suspect with bombs was arrested and his comrades were not happy, therefore, they came out in a well coordinated manner and began shooting and setting off explosions in the city. Sunday's church bombings, an almost weekly occurrence in Nigeria in recent months triggered a wave of fierce revenge attacks that killed many. Everything that happens in Nigeria today is Boko Haram. Let's blame our leaders for these massacres, they're not capable.